It's FABULOUS MOM FRIDAY and normally I'd be featuring another marvelous mama who makes amazing things. But today, I have some news for all of the wonderful women who read AFOMFT instead. Starting this Monday, it's going to be MOM MADNESS MONTH here on A FEW OF MY FAVORITE THINGS! What does that mean? 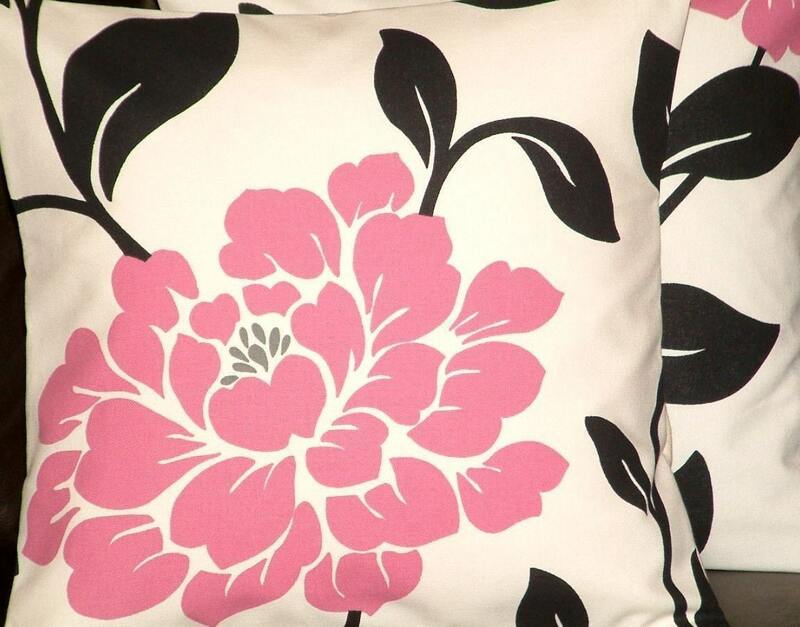 Throughout March, I'll be featuring fabulous finds picked just for you. From clothing and jewelry to home decor and products to pamper yourself, I'll be posting about more than 50 amazing things I know you're going to love. And that's not all. We'll also be hosting at least one giveaway a day and sharing terrific discounts too. I cannot wait until you see what we have in store! So be sure to check back Monday for the start of MOM MADNESS MONTH here at AFOMFT! Our giveaway-a-day party will be kicking off and there are a few other surprises lined up as well. You won't want to miss it. It's cold and snowy and dreary outside my window today so I'm dreaming of springtime and color and sunshine. Good thing it's Thursday so I can that inspiration for another set of FIVE FAST FAVES, my round up of grown up goodies I'm loving this week! 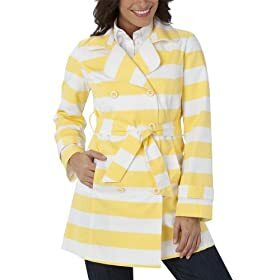 On a gray day like today, the idea of wearing this lovely lemon-y trench makes me smile. I need this. Stat! Love the clothes from Anthropologie but not the prices? Then eShakti is the sit for you! You'll find adorable clothes like this tunic for a fraction of what you would at Anthro. Another plus? You can customize the neckline, sleeve type and tunic length to your exact specifications. If that's not heaven, I don't know what is! 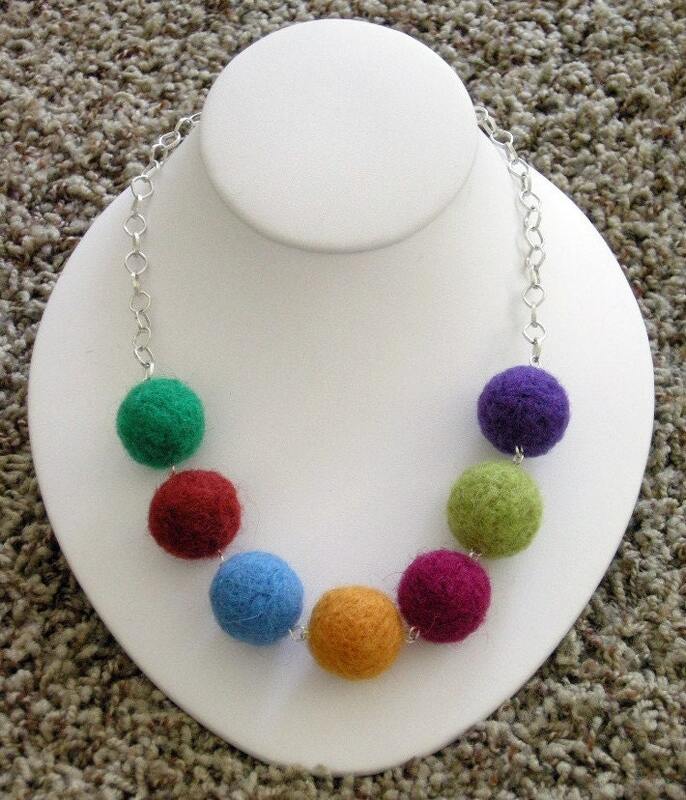 This fabulous felt ball necklace is a great way to pop some color into any outfit and therefore, the perfect accessory for spring. That is all. I can picture wearing these fabulous flower-adorned sandals with just about everything I own this summer. And you can never be in a bad mood when you're wearing flowers on your feet! So those are the colorful things I'm loving right now. What about you? Post a comment telling me what glorious goodies you've got your eye on this week! Better in Bulk is a blog written by a stay-at-home mom with five children named "Lolli." The tagline for the site is "Kids, photography, blogging and candy are all better in bulk." I couldn't agree more! In keeping with the bulk theme, Lolli refers to her family members on the blog by candy nicknames - Lolli (short for Lollipop) is married to CandyMan, and they have three daughters - KitKat, Necco and Reese - and two sons - Twizzler and AJ (short for Almond Joy). She writes about motherhood, shares wonderful family recipes and hosts great giveaways. But my favorite part of Better in Bulk is the terrific photography tutorials. Bloggography is run by Lolli and Beth from Manic Mother, and together, they walk novice DSLR owners like me through everything from ISO and shutter speed to aperture and megapixels on both Canon and Nikon cameras. And each week's lesson comes with a photo challenge where you can put your new knowledge to the test. If you're anything like me and have been shooting blindly with your DSLR, check out the Bloggography tutorials. I'm already seeing an improvement in my pictures after just a few lessons. Guess photography is Better in Bulk! Congratulations ASHLEY! You've won the Diaper & Wipes Case from Zanie Zoo! Please e-mail me at afomft@gmail.com by end of day Friday, February 26th to claim your prize. If I do not hear from you by then, a new winner will be chosen. Dear AFOMFT, I have a one year old daughter, Stella, who's just starting to get invited to birthday parties for her playdate pals. I know I could get them an outfit or something from Toys R Us but I'd rather give them a gift that's more unique, maybe even educational. And not Melissa & Doug. I love their stuff but we got so many of their toys for Stella's birthday that I'm hoping to find with something more original. Does what I'm envisioning even exist? Seems like a simple game, right? Well, it also helps promote developmental logic. 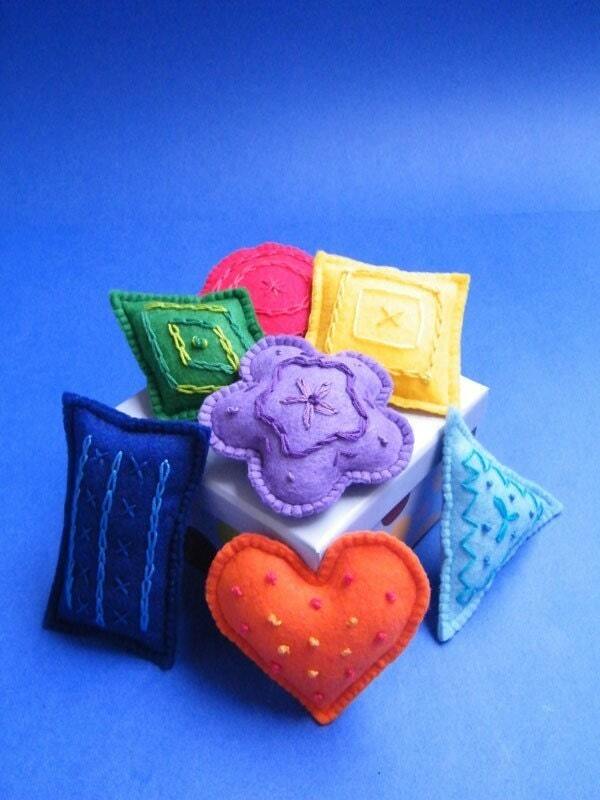 And this Rainbow Set will help your child learn about colors and shapes. 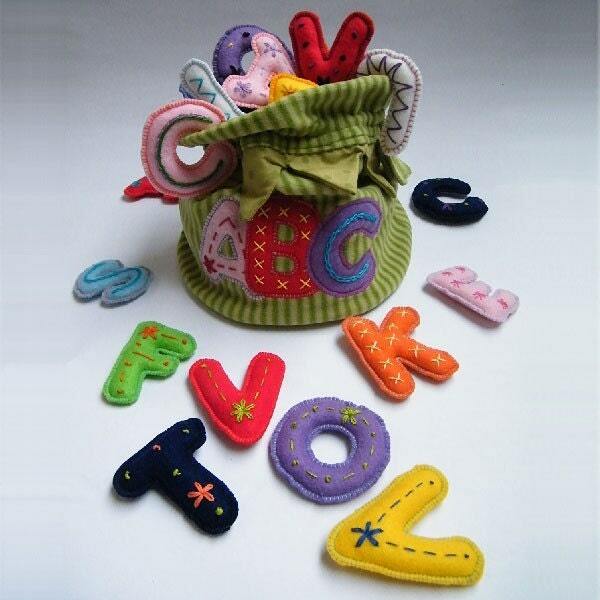 And the Vegetable Alphabet Learning Set is great for older kids. It comes with all of the letters they'll need to spell "potato" and "carrot" along with fun foods to inspire their creativity. 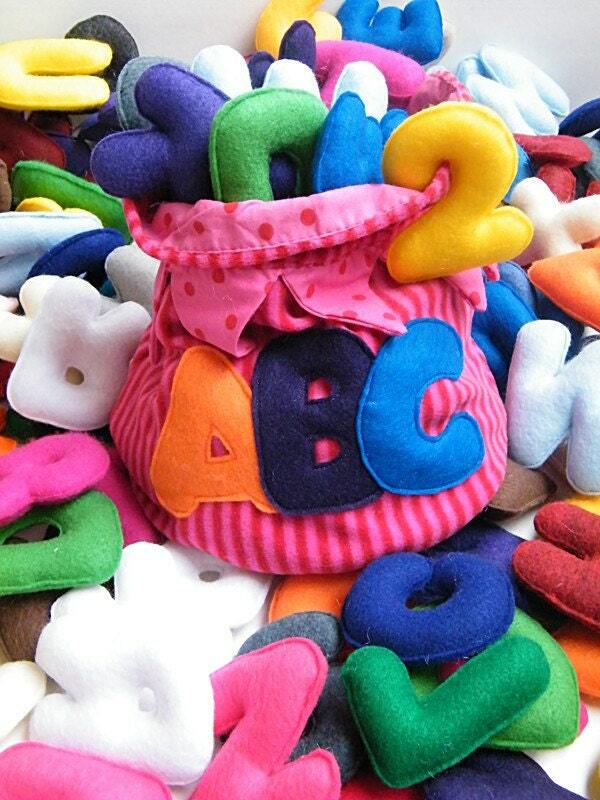 You can order the numbers and letters plain or embroidered so each set will be completely unique! They're just $9 each and the perfect toys to help foster any child's imagination. 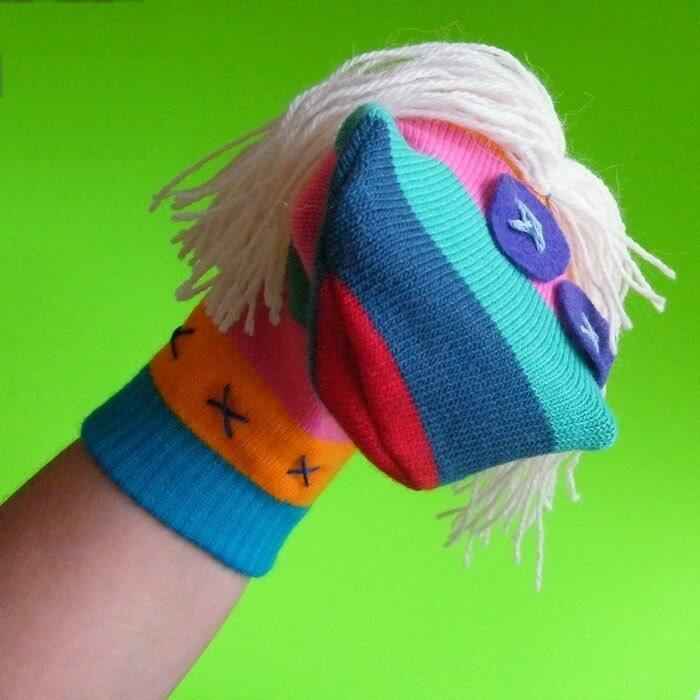 And did I mention that Evgie only uses eco-friendly felt made of 100% post-consumer recycled plastic bottles? Just one more thing to love! 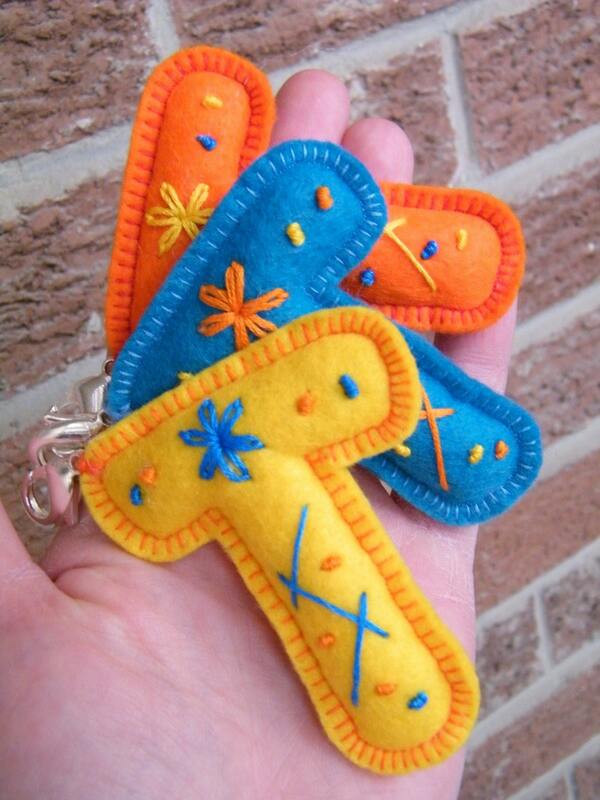 Evgie has graciously offered to give away two keychain letters to a lucky AFOMFT reader! Ask your friends to become a fan of AFOMFT on Facebook by sending them this link - http://tinyurl.com/AFOMFTFBFAN - and post a comment here with the names of each one who does. You'll earn one entry per new friend who becomes a fan and names will be cross-checked. Please leave a separate comment for each entry and make sure to include a link to your tweet, blog post, etc. This giveaway is open to residents of the U.S. and Canada and ends March 2nd at 11:59 pm EST. The winner will be selected by random.org and announced on AFOMFT on March 3rd. If the winner doesn't contact AFOMFT within 48 hours, a new drawing will be held so be sure to check back to see if you've won! I hope everyone had a great weekend! I mentioned earlier this month that I'd have some big news for you and here it is - I'm re-launching AFOMFT in March with a new look and some terrific new features. My goal is to make this blog even bigger and better than before but I can't do that without a little help from you. I've put together a reader survey and would be so grateful if you could take a few minutes to fill it out. You can find the survey HERE. All of your responses will be completely anonymous so feel free to be completely honest. Thanks in advance! Today's FABULOUS MOM is Joanne of Two By Two Creations. She's got twin daughters around the same age as mine and named of her business to honor her two cutie pies. So sweet, right? 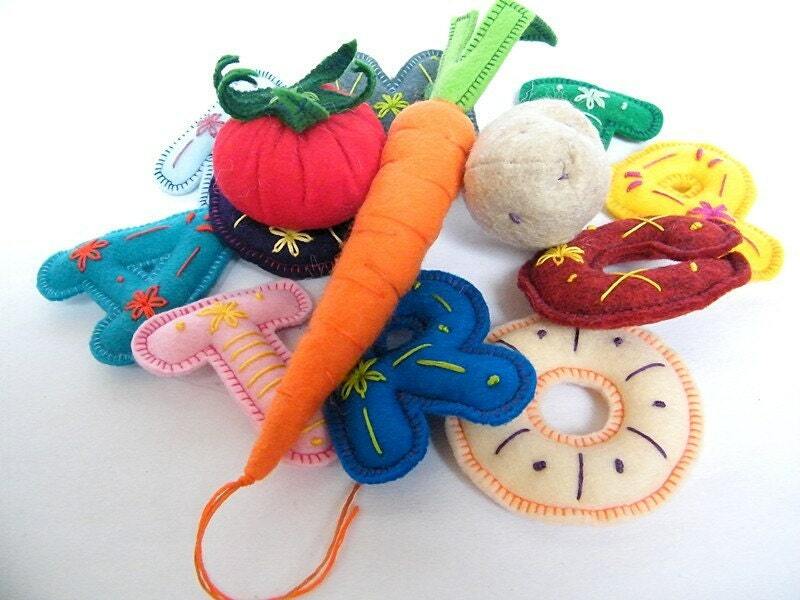 Two By Two Creations started after Joanne found herself disappointed in the quality of the things she bought for her little girls so she started making things herself. From hair bows and hats to tee shirts and tutus, Joanne's products are not only adorable but well-priced too. And, as she likes to say, everything is toddler tested and mommy approved! This mommy sure approves of these super cute hats. I mean, really. How cute will these be for spring? You probably know by now that I'm a sucker for tutus and Two By Two Creations has some of the prettiest around. I love the way Joanne blends two colors together and musses up the tulle. 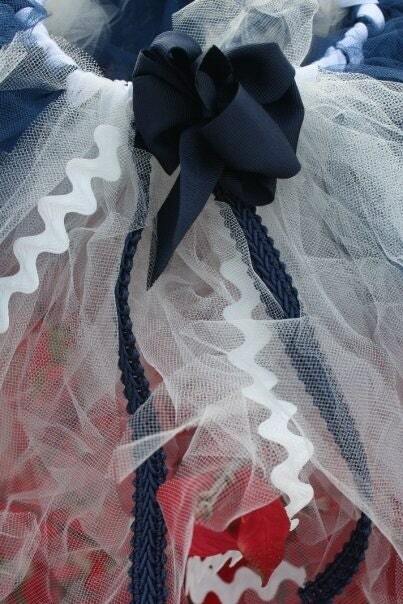 And just look at the fun ribbon and Ric Rac detailing! You can outfit your little girl from head-to-toe in Two By Two Creations. They also carry the cutest hair clips. But moms of boys, don't worry - Two By Two Creations has something for your little guys too! Take a look at AFOMFT reader Jenny's sons Hudson and Miles in the Valentine's Day shirts Joanne made for them. So sweet, right? Well, with St. Patty's Day right around the corner, you know you want some great green goodies for your McCuties. Luckily, Two By Two Creations has you covered. I think Joanne sums it up best with this quote from her website: "I love the look on a little girl's face when she loves her bow or when a mom loves the shirts for her son. It makes me feel so great knowing I am helping to bring smiles to peoples' faces." You can see that love in each and every one of her products and I'm sure anything you order will bring a smile to your face too. Please leave a separate comment for each entry and make sure to include a link to your tweet, blog post, etc. This giveaway is open to residents of the U.S. and Canada and ends February 26th at 11:59 pm EST. The winner will be selected by random.org and announced on AFOMFT on March 1st. If the winner doesn't contact AFOMFT within 48 hours, a new drawing will be held so be sure to check back to see if you've won! It's time for another set of FIVE FAST FAVES, my round up of grown up goodies I'm loving this week! I'm really digging tunics right now. They're great for transitioning from winter to spring because you can wear them with leggings now and then with tights and eventually with bare legs. And god, are they comfy! Sigh. Aren't these swatches drool-worthy? There's something about pretty fabrics that just makes me smile and this photo from the amazing NYC store Purl Soho brightened up my day today. They're having a terrific sale on yarn and fabric right now so if you're in the market for some colorful craft supplies, head on over. Now if I can just learn how to use my sewing machine, I'll have an excuse to buy such pretty pieces too! 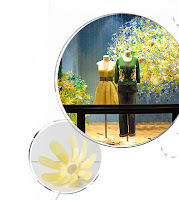 See this gorgeous window display and the close up of that beautiful blossom? Would you believe they were made from old water bottles? 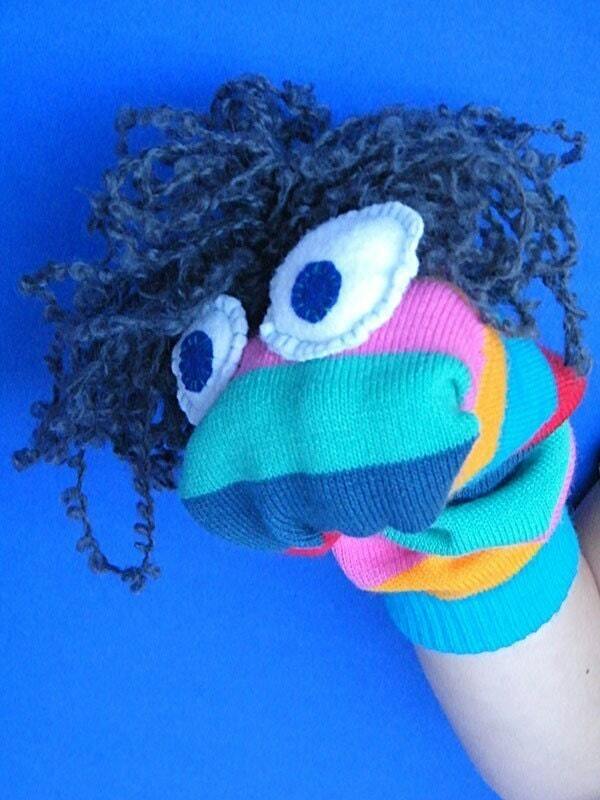 Happy Together has a full tutorial on how to make these recycled stunners. You can prettify and save the environment simultaneously! A statement ring perks up any outfit but it shouldn't have to break the bank. Like this pearl and rhinestone number from Forever 21. It may look like it costs the big bucks but actually, it's less than $5! $4.80 to be exact. Can't go wrong with that! 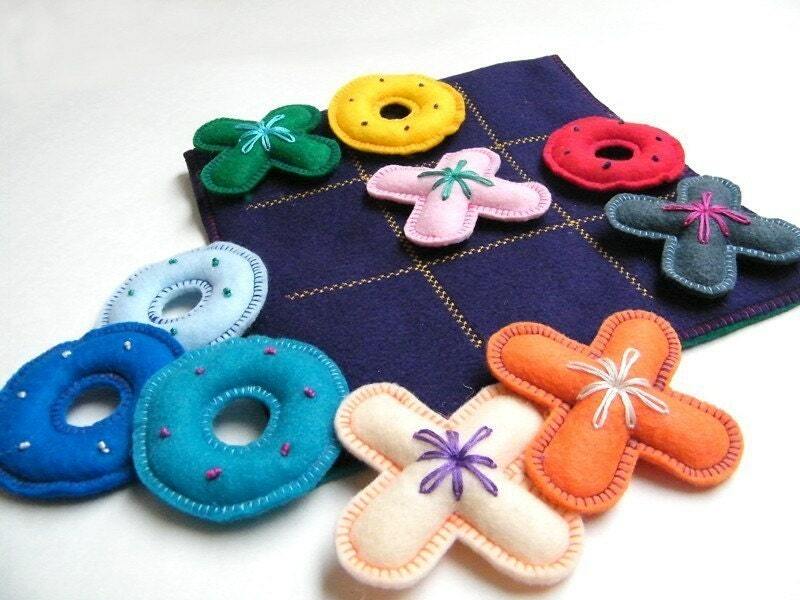 The pillow has colorful flowers made from Ric Rac and accented with buttons! How can you not want one? So that's what I'm loving right now. What about you? Post a comment telling me what you've got your eye on this week! DEAL ALERT: Great Freebies at Vistaprint!